I think it's safe to say the new Liverpool Central's a triumph. I stepped off the train this morning into a gleaming, shiny white new world. 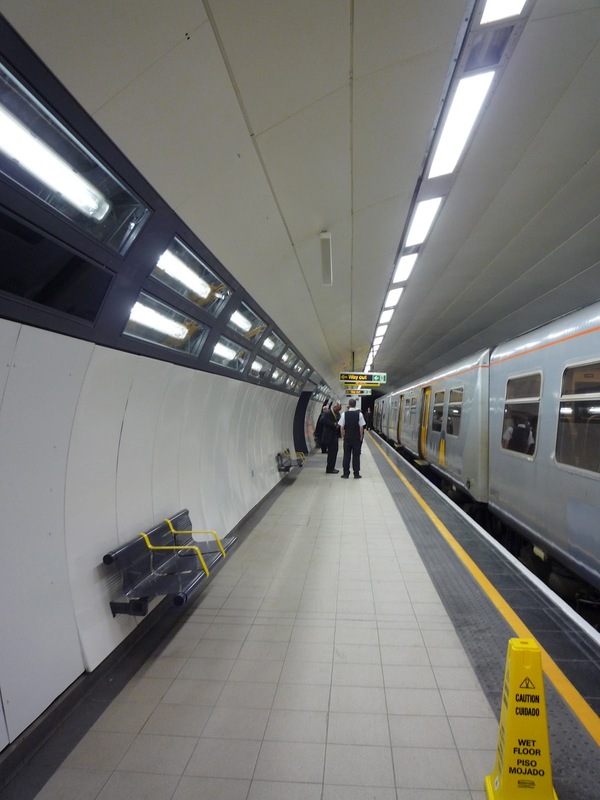 The Wirral Line platform (the Northern Line is coming in the Autumn) is now a wonderful place to be. Yes, those timetables are pasted on the wall. That's going to get really unpleasant really quickly. Still, as you can see from the light boxes above, there's still a lot of work to do. As I worked my way up to the concourse my fellow escalator riders were mainly Merseyrail staff and hi-vis clad builders, staring at me and my camera as though I was some kind of lunatic. Ha! I don't know if it was because it was so early in the morning, or if it's the new white tiling, but the station's acquired a zen-calmness. Again, the lack of posters adds to the effect. The station suddenly feels like that very calm transit station at the start of Star Trek: The Motion Picture: gleaming, pale efficiency. The posters reappear at the mezzanine between escalators, so any hope I had that they were being replaced by whizzy LCD video screens was dashed. Also gone: that massive poster space over the head of the Wirral Line escalators, the one that advertised a computer game shop that stocked games for "Commodore, Spectrum, Amstrad" well into the 21st Century. I wish I'd got a photo of that while it was still there. Sigh. Anyway, that's gone, to be replaced by some tiles. Probably for the best, as the last advertiser there was the Sony Centre on Paradise Street, and they've gone the same way as the Commodore. It's a cursed space. All this is, of course, just the hors d'oeuvres before le grand buffet: the new look ticket hall. I'd lowered my expectations, to be honest, trying not to have high hopes. There was no need. Damn it looks good. That big yellow space on the left is the new-look toilet area. It's no longer a grim, UV-lit hole; instead it looks like something straight out of The Colour Tsars' fantasies. There are LCD advertising spaces up here, as well as photos of the old Liverpool Central building across the back wall (unfortunately my pic was hopelessly blurred - sorry!). Turn right and you pass through the ticket barriers - exit barriers in the centre. The MtoGo's had a bit of a tarting up, though not much because obviously it's still pretty new. It's been re-branded over the door - "easy-to-eat food" - just in case you were worried that they were selling live squid or doughnuts with nails in or something. That emergency exit on the left, incidentally, isn't permanent, in case you're worried that the Colour Tsars missed a bit. That will eventually give escalator access to the new Central Village development. The biggest change in the ticket hall is... light. There's actual, real daylight streaming into the hall now. A major design flaw in the old station was the location of the lift down to the platforms. It was actually outside, meaning that the disabled, the elderly and mothers with prams had to walk through the rain to get out. That area has now been brought into the main ticket hall and roofed over with a glass ceiling. It makes everything so much brighter, and also means you get a good view of the Victorian rooftops behind. Also in this space is the final part of Grant Searl's Animate the Underground series. It previously got the short straw, being stuck on the floor of the station in a spot where you couldn't pause and contemplate it. Now it brightens up the path to the lift, and it looks so much better. Did they ever announce what the solution to the riddle was, by the way? I don't remember seeing it anywhere. Basically, Liverpool Central's a joy. They've taken it, washed it down and made it new again. My only concerns are those posters stuck to the walls (that can't be the final version, can it?) and a tiny worry about whether those brilliant white walls are going to stay brilliantly white for long. I feel like standing at the entrance to the station and confiscating magic markers off particularly cheeky-looking scallies in case they decide to mark it for posterity. After a bit of shopping, I got the train back from Lime Street, meaning that we paused at Central and I got to see it gleam all over again. There were some dignitaries on the platform (presumably they're waiting for the Northern Line to reopen before they invite me round - I can do the official opening, if you want, Merseyrail). I loved watching people getting off the train and taking it all in, and I can't wait for the new look to spread across the other underground stations. I've seen the future, and it's ruddy marvellous. You've met Bart Schmeink, you've met Mr Square Loops, but have you ever knowingly met a colour tsar? If you do actually manage to do the official opening, I wonder if any of them will be present, admiring their handiwork. They should be easy to spot. Very nice. The pasted-on timetables are a bit odd, but I suspect some poster frames will be added in due course. My one criticism - the "Next Train" indicator on the Wirral platform is still neatly positioned between the two "Way Out" signs, where it can't be seen from most of the platform! I assume the Colour Tsars will spend the opening ceremony rubbing themselves up against the yellow and grey toilet walls. I agree about the placing of the Next Train indicator but to be honest, I've given up on them ever getting that right. It's a problem that plagues the Underground as well. How can I apply to be a Colour Tsar? From your text and pictures the place looks really rather splendid. I just hope that by the time I get to see it, those beautiful white walls don't boast the smears of a thousand dirty hands (not to mention dirty minds). my mate sam f designed this!!! he says thanks for your wonderful comments, he really really appreciates your photos and loves the site. What would happen to the cold, dank, gloomy, moss laden ambience of Green Lane station if they applied this type of treatment? around the station .there isnt "1" bin we could find to pu our rubbish in. thanks . 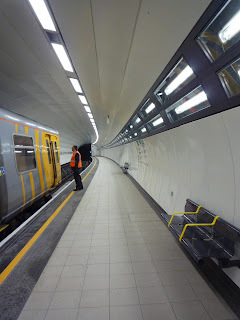 I'm the director of Design MAD the company that designed Liverpool Central, thank you all for your kind comments and appreciation of the upgrade of one of Lord Adonis's previously 10 worst UK stations. 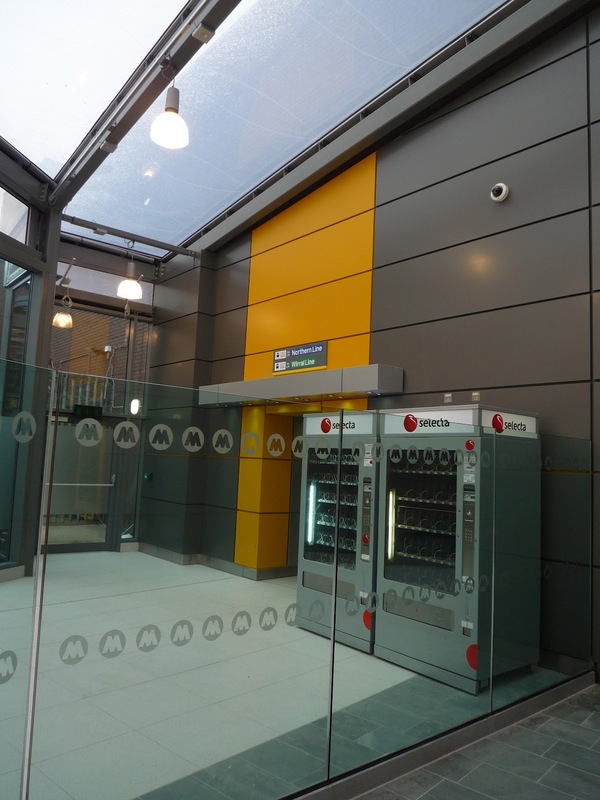 As to colour Tsar Central has many entrances the bright yellow is an orientation feature designed to assist passengers with a memorable orientation point. 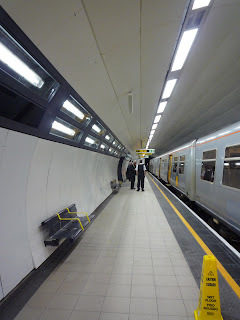 Let me list a few improvement statistics, concourse extended by 42% by floor area, public toilet provision increased by 90%, in creased ticket gate provision 45%, not seen by the public a glass link bridge to much improved staff facilities and of course the 320% increased daylight area. Kudos to you and your team Mike; a great job well executed. Hopefully you'll be allowed to have a proper crack at Moorfields!